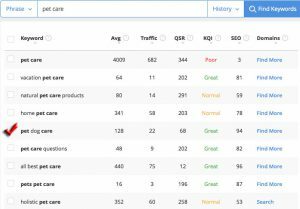 Are you concerned with your keyword and website ranking? I am. Ranking is important if you want to be visible to your target audience. When someone is looking for the product or service you are offering, you would like to be on page one to get noticed. With low ranking numbers, your target audience won’t find you. Most people tend to click on pages found on the first page. The first-page status tends towards authority in any given niche. With this in mind, people don’t usually take the time to scroll much further. So of course, the higher ranked you are, the more visitors you will receive. The issue is, unless you’re a very large or highly authoritative site like Wikipedia or YouTube, it won’t be easy. But it’s not impossible! You may not get high ranking 100% of the time, especially if you have a new website trying to rank for a popular keyword. But if you use the proper tools, you can greatly increase your chances. Hi, my name is Suzanne and I’m here to walk you through my process of finding keywords with high ranking value, which in turn leads to a high ranking website. 2 OK, So Where Do I Start? 3 Would You Like To Know Which Tool I Use? In years past, you had to guess that the keywords you used would have traction in the search engines. Or you would do some searches for words in Google, for instance, and come up with very broad results like how many pages were found with that word. You had no way of knowing how many times that word was searched in a month, or how much competition it had. Technology has come so far since then. Now there are tools that give you all this information and more. No more guessing if your keywords are popular. No more wondering how much competition you will have. With these statistics, you’ll be able to find keywords that are being searched online, with low competition, and giving you the best opportunities to rank on page one. 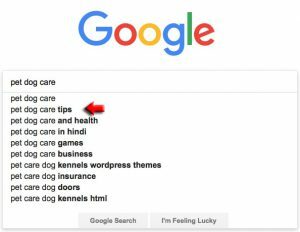 Let’s say my niche website is pet care, and I want to write content on that subject. 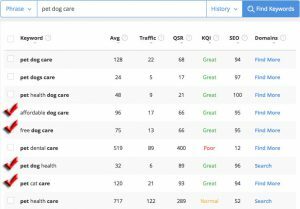 “Pet Care” is still too broad of a keyword (too much competition). You definitely want to choose keywords that are relevant to your business, but you want to have a more targeted audience to reduce the competition. 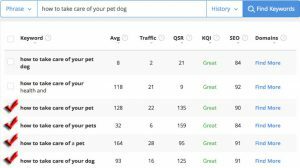 As you can see, the keyword “pet care” has a lot of traffic each month at 4009 average searches. That’s great BUT the quoted search results (QSR) of 344 is the number of websites ranked in Google, for that exact keyword. That’s not good! Ideally, you want a QSR under 100. The keyword quality indicator (KQI) tells me it’s a poor choice to use and would only give me a 3 out of 100 chance of getting ranked on page one on google. If I look down the list, I see other alternatives the tool gives me, with all the associated metrics. Using the keywords “pet dog care” would be a much better choice. It’s targeted to a more specific audience, which is always a better business strategy. “All best pet care” is great too except that it doesn’t make sense. Ideally, you want your keywords to be readable. So let’s click on “pet dog care” to get some more ideas. I would check off these and save them to my keyword list that this tool provides. They would all make great articles for my niche. Another way to get ideas is to use the alphabet soup technique. This tool can do this for me with a click of a button. You notice how the keyword is getting to be a longer phrase? These are long long-tailed keywords and very targeted. Personally, I prefer using long-tail keywords. They clearly show the intent of the person searching for a solution. The monthly searches may be lower with this type of keyword, but you know that your visitor is looking for exactly what you’re offering. Which means it’s a good chance you’ll get a sale. 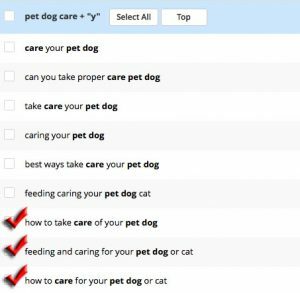 So let’s go back and type in “how to take care of your pet dog” into the keyword search bar. I’ve now found 4 or 5 additional long-tail keywords to save to my list for future content. Another way to go about this is to use the google search bar and its predictive text. These suggestions that Google shows you, are actual searches being done by people online. These are the “popular” searches. Here I found another idea. I like the term “pet dog care tips”. Using this idea, I go back to my keyword tool and type it in. I again find many keywords I like on my list. If I keep going like this, I can end up with a keyword list that would give me many topics for future articles. The most important thing I’ve done is find keywords that give me the best chances of ranking on page one. Would You Like To Know Which Tool I Use? It’s called Jaaxy. This is my favourite tool to use as it gives me all I need to achieve great keyword and website ranking. It offers the basic information I need plus more. Jaaxy works great for me and I know it will for you too. This is my review of Jaaxy. Enterprise Plan – $99/month offers serious users so much more. Would you like to try it for free? Below is the Jaaxy search bar. Just type in any keyword you might have in mind, and it will bring you to the free sign up page. No credit card needed. Just a free account. It will then show you all the metrics I showed you in my searches above. Jaaxy was created by the same owners of Wealthy Affiliate University, the best choice for an online training platform. If you’re in the market for excellent training, at the best price you’ll find online, please click the button below to see my review. So this is how I find all my keywords and have found success. I know you can too. Have you found some really great keywords for your articles? If you have any questions, please comment below. If you know anyone who could benefit from this article, please share. 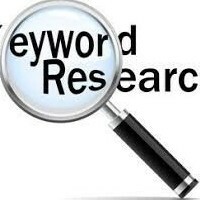 The information you gave on finding keywords is absolutely awesome and well explained. It is going to help me a lot with my affiliate marketing moving forward. Thank you so much for this great info!! Thanks, Eden, I’m glad you found it helpful. Please consider using Jaaxy for your keyword research. It’s such a powerful tool and will help your business enormously. There are many features that I didn’t go into detail, but my review will help with that. If you have any questions, please let me know. Selecting the right keywords in your posts are vital for traffic as you point out.This is a great guide for any blogger just starting out as you have covered all the basics nicely. Thanks for your comment! I try to write for beginners to understand, so I’m glad you found it useful. Keywords are the most important thing for ranking, so we need to learn how to find the proper ones. Jaaxy is the perfect tool for this. Thank you for sharing this information. It will be very help for our website too. Hi Tara, and thanks for commenting. I’m glad you liked the article. Jaaxy is such a powerful tool that you can use so many different ways. 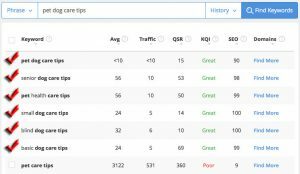 It’s indispensable for keyword research, but you can also use it to check your site rank and your competition’s keywords. If you have any questions, please let me know. I sure could have used this walk through a few years ago before I found Wealthy Affiliate training. I use the Jaaxy keyword tool and it’s very helpful . I’m glad you enjoy Jaaxy. It’s an excellent tool that I use daily. Couldn’t live without it, haha. You have made it easy to follow and find some of the best keywords for your articles. I have found Jaaxy easy to use and a very useful tool for getting traffic for my site. With less than an hour of work, you can find enough keywords for 20-30 articles. Do you ever use the ones with less than 10 in traffic. Occasionally I do if I can’t find the right keyword I want. Google crawls all the words in your article, so it will get ranked anyway. It’s more important to write an article that makes sense and sounds conversational. Thank you for this great article. Wow the top 5 search results get nearly 70% of all searches. That is amazing. Thank you for this great review on Jaaxy. I already use Jaaxy and I couldn’t imaging picking quality SEO keywords without it. I agree. Jaaxy is a very powerful tool for SEO. I couldn’t live without it. It certainly helps to get great ranking, for as you can see, it’s best to get in those top 5 positions. Some people may search farther, but most don’t. Thank you so much for this well-written tutorial. I love Jaaxy and it has changed my online business drastically. Your recommended numbers for keywords are spot on. Hi Alex, and thanks for your comment. I couldn’t imagine trying to rank my articles without using Jaaxy. It’s a powerful tool that makes all the difference. I’m glad you enjoy it too. It’s simple to use and provides up to the minute data. It’s made a big difference for me as well. Suzanne, I use these tools routinely and I still learned a lot from your article. I will be using some of these methods in the future for more long tail keywords, which is all I use. I like to have an avg, of less than thirty and QSR way under 100 and this has helped me get my articles ranked on the first page routinely. Sounds like you have an excellent SEO strategy. I also try to use those keywords with the highest SEO chances. Jaaxy is such a great tool for all these metrics. I use it on a daily basis, and it’s brought me much success. I truly enjoyed reading your post. It was informative yet very simple to understand. You really have a great way of breaking things down that made it easy to follow. I totally grasped every word you said. I love using Jaaxy. I don’t know what I’d do without this keyword tool. Hi Ruby, and thanks for your kind words. My desire is to help beginners with online marketing, so I try really hard to make things understandable. It’s so easy to start using the business lingo, but I remember when I started. All the terminology was confusing. I’m glad to hear I’m still easy to understand, haha. I’m glad you enjoyed the article and found it useful. There is no way around keywords. When the right one hits your target audience, and you catch a prospect and interact according to where they are in the purchase cycle you are on your way to a payday. Thanks Maurice, you’re right! Proper keywords = targeted audience = sales. Glad you enjoyed it! I will use these tips for my web design. It’s very useful for people who would like to create a popular website. Hi Eli, I’m glad I could help. Best wishes on your website. I’m glad you enjoyed the article. I like to make my posts as helpful as possible and easy to understand. There are too many places online that just tend to confuse people, especially if they’re new to the business.